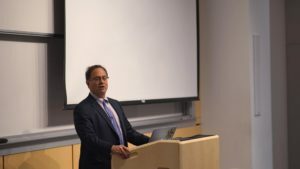 Wilson, keynote speaker at the Sigma Alpha Epsilon (SAE) speaker series, highlighted his experiences in government, personal triumphs and the role he played in repealing the “don’t ask, don’t tell” law. Wilson has been awarded the Department of Defense Medal for Distinguished Public Service, the Pentagon’s top civilian honor, and is currently the Chair of the Board of Advisors of the Truman National Security Project. Wilson, a former member of SAE and first openly gay Assistant Secretary of Defense for Public Affairs in 2009, said it “was an honor” to be part of this initiative. SAE, in conjunction with the Queer Events and Services Team (QuEST), Stanford in Government (SIG), Alpha Epsilon Pi, Theta Delta Chi and Kappa Kappa Gamma, organized Wilson’s talk. “It’s been part of our goal over the past few years to institutionalize some change in our organization. The speaker series was a great way to accomplish these aims. I can confidently say that three to four years ago we would not have partnered with organizations like SIG or QuEST to bring speakers to campus and host events,” said Nick Burakoff ’17, vice president of SAE. Wilson began by noting that his talk was “extremely appropriate, given the last 24 hours,” referring to Donald Trump’s victory because it has to do with people’s place in society. He linked this idea of identity to the 2016 election, and despite calling it the “most outrageous, divisive and disappointing exercise in politics,” he stated the U.S. will continue to remain divided until citizens can answers questions on their identity and role in society. Connecting the idea of identity to the repealing of “don’t ask, don’t tell,” Wilson spoke of the problems that he faced while working to repeal the law. When Obama was elected to office, he stated that he was “very surprised and proud” when asked to serve as the first openly gay Assistant Secretary of Defense for Public Affairs in 2009, knowing that his sexuality would “be an asset and not a disadvantage.” The administration wanted to repeal “don’t ask, don’t tell” by 2010, and he would be a part of that effort in ensuring that men and women across the armed forces would finally be able to serve openly. There was resistance within the army as many thought that repealing the law would encourage open service. Moreover, there had to be tangible proof that the troops would support a repeal. He recounted an incident with five soldiers that gave him some of this proof. When asked what their response would be if one them was gay, each stated they would not care and would continue to treat him the same. Wilson used this story and many others to garner support to repeal the law. “This story showed me that the military is a reflection of society,” said Wilson. Toward the end of the repealing process, former Secretary of Defense Robert Gates said that the process got “very political.” He believed that many senators, like John McCain, were reluctant to repeal the law for political reasons. In fact, the repeal was defeated twice in the Senate. “It took many different people, including Sam Nunn, the author of ‘don’t ask, don’t tell’ to call for its repeal in the press,” said Wilson. Wilson was also grateful for Chairman of the Joint Chief of Staffs Michael Mullen’s efforts in summarizing the debate in two central points for the Senate. The first one was that “service members cannot live a lie,” and the second was that “those who lead them must do what’s right for them.” Wilson believed that had it not been for these individuals, the repeal act would not have passed in the Senate. The repeal, in his opinion, prevented thousands of gays and lesbians from serving the country as complete individuals. Wilson also recounted societal changes. “I grew up not being able to talk about sexual orientation. We never knew who or what we were as we became adults. We pretended our differences didn’t exist. We did everything we could to blend into the crowd and be accepted,” said Wilson. When asked what advice he would give to those who are confused about their sexual orientation, he said that being able to find a place where people of all walks of life, sexual orientations and ethnicities can come together to do an activity can help people overcome their fears. He concluded by stating his belief that a human touch can help bridge divides and helps others integrate into society. Contact Vibhav Mariwala at vibhavm ‘at’ stanford.edu. Vibhav Mariwala is a sophomore from Bombay, India, studying History, Psychology and International Relations. Vibhav is a Desk Editor for the Campus Life Beat within News at The Stanford Daily, a member of the club badminton team and part of BASES, an entrepreneurship group.